Baptism is a Holy Sacrament by which we are born again by being immersed in water three times in the name of the Holy Trinity; the Father, the Son and the Holy Spirit. The Sacrament of Baptism has the first rank among the Seven Holy Sacraments, as it is the door by which the believer enters the church and has the right to partake in the rest of the Sacraments. The Lord Jesus Christ instituted the Sacrament of Baptism by being baptized by John the Baptist in the River Jordan, when the Holy Spirit came upon Him as a dove, anointed Him, then assured it after the resurrection when He said to His disciples: “Go therefore and make disciples of all nations, baptizing them in the name of the Father and of the Son and of the Holy Spirit” (Matthew: 28:19), “He who is baptized will be saved, but he who does not believe will be condemned” (Mark 16:16). Baptism is a redemptive Sacrament, necessary for redemption and entry to eternal life according to what the Lord said: “Most assuredly, I say to you, unless one is born of Water and the Spirit, he cannot enter the Kingdom of God” (John 3). It is one of the four redemptive Sacraments: Baptism, Myron, Confession and Communion of the Holy Body and precious Blood of the Lord. Through Baptism, the believer is reborn a spiritual birth from the Water and the Spirit; his first birth being from his parents. The best time for Baptism is Sunday before Mass, as the priest is fasting because Baptism is death and resurrection, and Sunday is the weekly memory of the Lord’s Resurrection. The wisdom of granting the Sacrament of Baptism right before the Mass, is so that the baptized person and his parents may attend the Mass, and receive the Holy Sacraments. The Sacrament of Myron, also known as the Holy Anointment, or the Sacrament of Confirmation, is a holy Sacrament, with which we receive the seal of the Holy Spirit. The word ‘Myron’ is a Greek word which means ‘ointment’ or ‘fragrant perfume’. The baptized person receives it immediately after Baptism, so as to become a temple of the Holy Spirit. The Holy Spirit aids him to grow in his spiritual life. Although it is received directly after Baptism, it is an independent Sacrament and the priests have to be very careful to grant it accurately to the baptized, anointing them with 36 crosses. The Lord Jesus instituted it when He said: “If anyone thirsts, let him come to Me and drink. He who believes in Me, as the Scripture has said, out of his heart will flow rivers of living water”. But this He spoke concerning the Spirit, whom these believing in Him would receive, for the Holy Spirit was not yet given, because Jesus was not yet glorified” (John 7:37-39). The Baptized is anointed with 36 signs on his joints and senses so that the Holy Spirit can dwell within them. His body and soul becomes a temple of the Holy Spirit. By this anointment, God grants the grace of confirmation to the baptized as well as the gifts of the Holy Spirit. Anointing the external organs by the Myron oil denotes anointing the power of the internal soul and its spiritual senses by the power of God to fight the hosts of evil and its power. This is because the Myron is the most powerful weapon against the devil and the best protection against sin and its seduction. Our fathers the apostles granted this Sacrament by the laying of their hands after Baptism, as we read in the Book of Acts when St. Peter and St. John laid hands on the people of Samaria who were baptized in the name of the Lord Jesus, and so received the Holy Spirit, (Acts 9:2-6). As the laying of hands for the dwelling of the Holy Spirit is a specific rite of the fathers the Apostles and their successors the Bishops, and as the regions of mission increased, consequently the number of believers and those who entered faith increased. It was not possible for the Apostles to wander through all the countries and cities to lay hands on the baptized, so they established anointment by Myron as an alternative for the laying on of the hands for the Holy Spirit’s indwelling. The Sacrament of Repentance and Confession is a holy sacrament, by which the sinner returns to God, confessing his sins before the priest to be absolved by the priest through the authority granted to him by God. By this absolution the confessing person is granted the forgiveness of those sins which he confessed. Confession means admitting and declaring a certain matter. The Sacrament of Confession means verbal confession before the priest of sins and mistakes committed by a person, and confessing and humbly repenting, in order to be granted the absolution and forgiveness. Our Lord Jesus Christ founded the Sacrament of Repentance and Confession when He said to His disciples, the pure apostles: “Assuredly, I say to you, whatever you bind on earth will be bound in heaven, and whatever you loose on earth, will be loosed in heaven” (Matthew 18:18). Also, after the Resurrection the Lord said : “‘As the Father sent me, I also send you.’ And when He said this He breathed on them, and said to them, ‘Receive the Holy Spirit. If you forgive the sins of any, they are forgiven them, if you retain the sins of any they are retained’” (John 20:21-23). By this He gave them the authority of binding sins or loosing them, through the authority given to them by the Holy Spirit, and according to the contriteness of the confessing person. Contrite heart and remorse for previous sins. Strong faith in Christ and hope in His love to forgive. Verbal confession of sins before the priest. Parents must teach their children about the Sacrament of Confession from an early age, say, about twelve years old, so they may be acquainted from childhood with the Sacrament, for as the proverb says: “Teaching in childhood is like engraving on rocks”. The Holy Eucharist is also known as : the Sacrament of Holy Communion, the Sacrament of Thanksgiving, the Lord's Supper, the Mysterious Supper, and the Sacrament of Communion. The person baptized must receive Communion directly after Baptism. The repentant person must receive Communion after having confessed. The person who marries must receive Communion after the wedding, (which must take place between the Matins and Holy Mass), according to the original Rite of Matrimony. Also, whoever is ordained with any priestly rank must receive Communion following the Holy Mass of his ordination. The Lord Jesus instituted the holy Eucharist on Covenant Thursday, in the Upper Room of Zion, shortly before His arrest and trial. After He celebrated the Rite of Passover of the Jews, He rose and washed the feet of His disciples, as a sign of repentance and preparation, then sat down and instituted the Passover of the New Covenant, which is the Sacrament of Holy Communion. “He took bread, blessed it and broke it, and gave it to the disciples and said, ‘Take, eat, this is My Body’, then He took the cup and gave thanks, and gave it to His disciples saying, ‘Drink from it, all of you, for this is My Blood of the New Covenant, which is shed for many for the remission of sins’” (Matthew 26:26-28), and our teacher St Paul repeats the same words in 1 Corinthians (11:23-25). The Sacrament of Holy Communion has many benefits, such as : Abiding in Christ according to His precious promise: “He who eats My Flesh, and drinks My Blood abides in Me, and I in him” (John 6:56). By receiving this Sacrament we become members of His Body, of His Flesh and of His Bones (Ephesians 5:30), and we also become partakers of the Divine Nature, (2 Peter 1:4). It gives us the promise of eternal life : “Whoever eats My Flesh and drinks My Blood has eternal life and I will raise him up at the last day. He who eats this Bread will live forever” (John 6:54,58). It provides growth in the Spirit and spiritual perfection and life in Jesus Christ, for He said: “For My Flesh is food indeed and My Blood is drink indeed. As the living Father sent Me, and I live because of the Father, so he who feeds on Me will live because of Me” (John 6:55,57). As food develops the body and keeps it healthy, so too the spiritual food, which is the Holy Body and Blood of Christ, strengthens the soul so that it may grow continually in grace. It provides remedy to the soul, body and spirit, as we say in the Offertory Mystery : “That they (Holy Body and Precious Blood) may become to us all for participation and healing and salvation for our souls, bodies and our spirits”. Our holy church fathers called Communion ‘the remedy for the death of sin’. Is anyone among you sick ? Let him call for the elders of the church , and let them pray over him , anointing him with oil in the name of the Lord (James 5:13). The Sacrament of the Unction of the Sick is one of the holy Seven Sacraments of the church, through which the sick who are faithful, are healed from psychological and physical diseases. The priest anoints the person with the holy oil from which they obtain the grace of remedy from God. It is called the ‘Sacrament of Lamps’, for the early Christians used to place oil in a lamp, from which hung seven other lamps. Each lamp was lit at the beginning of every prayer. This rite still exists, however, the seven lamps were replaced by seven wicks, made from cotton wool, which sit in a plate of oil. The number seven signifies the seven spirits of God, which are mentioned in the Book of Revelation (Revelation 3:1). The Spirit of God dwells and sanctifies the oil in order to heal those anointed by it. It is advisable that the wicks be placed in the sign of the cross, in the plate of oil. 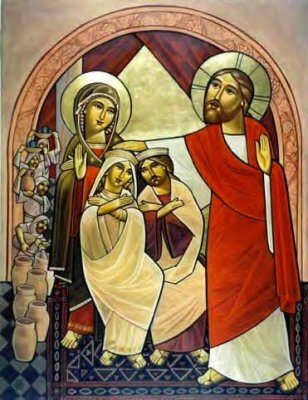 Our Lord Jesus Christ instituted this Sacrament when He said to His disciples: “Heal the sick, cleanse the leper” (Matthew 10:8), and, “Whatever city you enter, and they receive you, heal the sick who are there, and say to them, ‘The Kingdom of God has come near to you’” (Luke 10: 8-9). For the Lord Jesus came that we may have life, and that we have it more abundantly (John 10:10), so He healed the sick, raised the invalid, opened the eyes of the blind, purified the lepers and the lame, after having saved them and forgiven them their main cause of sickness, which is sin. “Jesus went about doing good and healing all those who were oppressed by the devil” (Acts 1:38), as Malachi prophesied about Him saying, “But to you who fear My Name, the Son of Righteousness shall rise with healing in His wings” (Malachi 4:2). Our fathers the Apostles practiced it according to the orders of their Master, as the Bible says, “So they went out and preached that people should repent. And they cast out many demons, and anointed with oil many who were sick and healed them” (Mark 6:12,13). Our teacher St. James advised the believers to practice this Sacrament when they are sick, and to ask healing from God, who says, “I am the Lord who heals you” (Exodus 15: 26). Also, David the Psalmist thanks God saying, “Bless the Lord, O my soul….Who heals all your diseases, Who redeems your life from destruction” (Psalm 103: 1-4), and, “O Lord my God, I cried out to You and You have healed me” (Psalm 29:20), and also the prayer of Jeremiah the prophet: “Heal me O Lord, and I shall be healed” (Jeremiah 17:4). For this reason, St. James advises us, “Is anyone among you is sick, let him call for the elders of the Church, and let them pray over him, anointing him with oil in the name of the Lord. And the prayer of faith will save the sick, and the Lord will raise him up. And if he has committed sins, he will be forgiven” (James 5:13,14). Matrimony is a holy sacrament, officiated by a priest, of uniting a man to a woman. Through this holy sacrament, the man and woman become one, for as the Lord Jesus said, “For this reason a man shall leave his father and mother and be joined to his wife and the two shall become one flesh. So then, they are no longer two but one flesh. Therefore what God has joined together, let not man separate” (Matthew 19:5,6). St. Paul expressed the sanctity of the Sacrament of Christian Matrimony, saying, “This is a great mystery” (Ephesians 5:32), and, “Marriage is honorable among all and the bed undefiled” (Hebrews 13:4). Christian Marriage elevates the bodily union to become a spiritual union, through the Holy Spirit, just as the Holy Spirit works in the Baptismal water to make humans a new creation, and works through the Sacrament of Confirmation to ordain a person to become a temple of the Holy Spirit. The Holy Spirit also works in the couple during the marital ceremony, through prayers and faith to unite them in the Lord. Through the commitments made by the bride and groom in fulfilling the commandments of marriage, and the work of the Holy Spirit, the two partners become one. Unity: Christianity believes and insists on the law of monogamy, for in the beginning God created male and female; one Adam and one Eve. Through Matrimony the two become one in Christ. Hence, they are no longer two but one body. Continuity: The purpose of Matrimony is continuance, without divorce, except in the case of adultery. This is because a strange person has entered and corrupted the holy unity of Matrimony, an profaned its holiness. However, if the person who sinned repented, and the partner forgave them, then the Church permits the continuation of the marriage. The second situation in which divorce may occur, is due to the spiritual immorality or denial of faith and abandonment of Christianity by one of the partners. The matter of annulment of Matrimony, is a matter authorized by the church, in the case where a partner had deceived or cheated the other, and even issues in regards to sexual impotence. 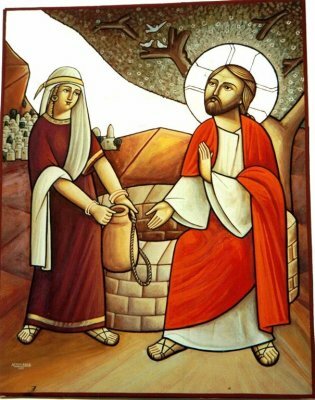 The Coptic Church believes strongly in the principle of one wife, and adopts its principle from the holy Gospels, which always alludes to man having only one wife: “Whoever divorces his wife and marries another commits adultery against her” (Mark 10:11), and as our teacher St. Paul says, “For this reason a man shall leave his father and mother and rejoined to his wife, and the two shall become one flesh” (Ephesians 5:31).ion (Revelation 3:1). The Spirit of God dwells and sanctifies the oil in order to heal those anointed by it. It is advisable that the wicks be placed in the sign of the cross, in the plate of oil. The Sacrament of Priesthood is a holy sacrament through which the bishop lays his hands on the head of the elected candidate, so that the Holy Spirit will descend on him and grant him one of the priestly ranks. He is then given the authority to officiate the Sacraments of the church, doctrines, and others. The word ‘priest’ is designated for a clergyman who spiritually serves people and their needs. The Jewish people referred to the person who offered sacrifices and oblations as a priest. In Christianity, the priest is a member of the priesthood who performs religious rites. The word ‘priest’ is derived from the Hebrew word ‘Kohen’, meaning priest. The word ogHb (Ooab) in Coptic, meaning ‘priest’, is derived from the Coptic word eqogab (ethoab), meaning saintly or righteous. Hence ‘Ooab’ is given to the priest to signify that he is a righteous man, adorned by holiness and purity. In Greek, the priesthood is called IeraTIoN (Eration), and the word for priest is eregV (Ereis), meaning minister (of the Sacraments and the congregation). It is also known in Greek as the “Laying on of hands”, and in Syrian as “Ordination”, and in Arabic as “Anointment”, signifying the granting of the seal of the Holy Spirit on the consecrated person.